The president of the National Academy of Sciences emphasized the power of hope in a keynote speech and 6,000 students received degrees Sunday at university Commencement on the National Mall. President of the National Academy of Sciences Marcia McNutt challenged George Washington University graduates to become “beacons of hope” in her Commencement address on Sunday. With the U.S. Capitol providing a backdrop, more than 26,000 people, including approximately 6,000 undergraduate and graduate degree candidates, attended the ceremony, which began under a sunny sky after a week of rain that finally cleared away, just in time for the big event. Hope provides the “antidote” to the “epidemic of despair,” which is driving societal crises like opioid addiction. Hope is realized from collective action when citizens feel empowered to change something, as has happened through the #MeToo movement. Hope is a byproduct of scientific discovery, such as stem cell transplants to cure diseases, leading to a better tomorrow. And hope is the “lifeline” thrown to lift someone out of poverty, protect the earth, save a species—or nurture a budding scientist. So the professor encouraged her to attend Navy SEAL Team school during her first summer to learn explosives training. “After I graduated first in class, upon returning to geophysics, I had no problem with the male culture. And no one messed with me,” Dr. McNutt said to laughter and applause. She would spend the rest of her career working to repay that professor’s mentorship forward, through her students, daughters and other colleagues. “The moral is: Hope is contagious. And it’s a good kind of contagion,” Dr. McNutt said. GW graduates, having had academic experiences integrating arts, sciences and the humanities, have the skills they need to become agents of hope, Dr. McNutt said. “Because hope is inspired when you can dream like the artist, show the heart of the humanist, formulate solutions with the insight of the scientist and execute projects with the precision of the engineer,” she said. Remarks from university leaders preceded Dr. McNutt’s Commencement address. Dr. Maltzman also introduced GW President Thomas LeBlanc, who is concluding his first academic year as university president. “As we approach our bicentennial, President LeBlanc has been continuously emphasizing the contributions that this university makes through the students it graduates and the research it conducts,” Dr. Maltzman said. Dr. LeBlanc continued “an important Commencement tradition” by thanking the parents, families and friends of the graduates. Mr. Carbonell also said his GW education and friends have stayed with him, enriching his life and preparing him for opportunities and challenges. Venessa Marie Perry, M.P.H. '99, president of the GW Alumni Association, spoke about the importance of GW alumni helping one another as well as giving back to the university through volunteering or philanthropy. "Our university is stronger, our future is brighter and our alumni are better off when we support each other." Student speaker Meenu Mathews, a B.A. candidate in the Elliott School of International Affairs, told the story of a family trip to D.C. when she was 10 years old. She described how she stared through the fence and across the lawn toward the White House and announced to her parents that she would someday be president. A decade later she would walk through the White House with her parents and reflect on that day and how her parents brought their family to the United States from India with dreams of a better future for their children. “If there is one thing I have learned during my time at GW, it is that each of us has the power to cross those fences, walk across lawns and open doors that we never even dreamed we could,” Ms. Mathews said. Dr. Maltzman also recognized this year’s four recipients of the George Washington Awards, presented to students, faculty and staff who have made extraordinary contributions to the GW community. Fjollë Caka, a candidate for a master’s of professional studies in sustainable urban planning; J. Andrew Carlander, a candidate for a bachelor’s degree in business administration; Liesl Riddle, associate professor of international business and international affairs; and Linda Neely Brown, associate director of Colonial Central, received the awards this year. Three other students— Kathryn Chevalier, Lauren Bell and Michael Ramirez—assisted Dr. LeBlanc in conferring honorary degrees Sunday to Dr. McNutt, Olympic medalist Elana Meyers Taylor, B.S. ’06, M.T.A. ’11, and Steven Knapp, president emeritus and university professor of English. Dr. LeBlanc highlighted the recipients’ many achievements and officially awarded a doctor of public service to Dr. McNutt and Ms. Meyers Taylor. Dr. Knapp received a doctor of letters. In her remarks, Ms. Meyers Taylor recalled the “bad day” she had in softball tryouts for the 2008 Olympic team. After she didn’t make the cut, her mother suggested she try out for bobsled, and Ms. Meyers Taylor continued to work hard and pursue her Olympic dreams. She urged graduates to keep dreaming, too. “Keep in mind that sometimes a very bad day could be the best thing that ever happened to you,” she said. Later, GW’s most important degree recipients of the day got their turns after Dr. LeBlanc offered his charge. The graduates would be joining a “lifelong and worldwide community” of GW alumni, now numbering more than 290,000. “You sought excellence. You took risks. You chose to lead,” Dr. LeBlanc said. He told graduates to always keep learning—“with open eyes, mind and heart”—to listen first and debate second, to offer respect and empathy and to embrace change while “never forgetting where you came from, how you got here and those who supported you along the way. “I know that through your many and varied contributions to society, and in service to others, you will continue to bring distinction not only to yourselves but also to your families, to your communities around the world and, beginning now, to your alma mater,” he said. 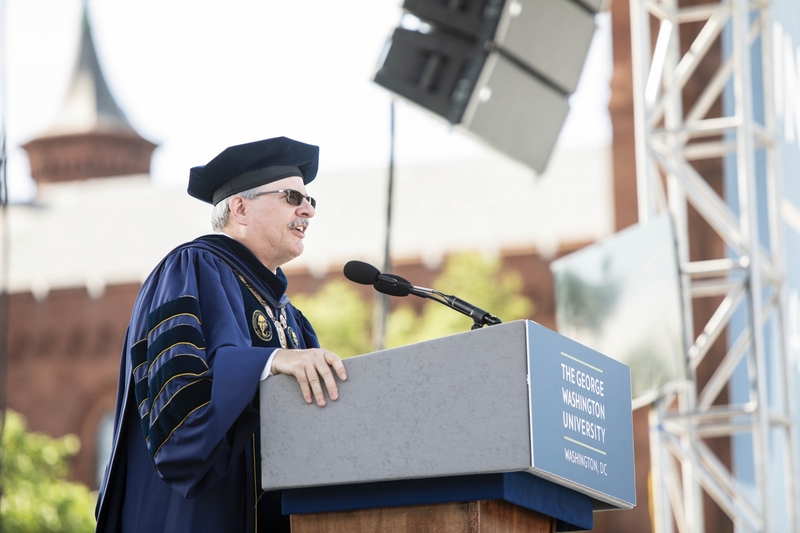 The George Washington University 2018 Commencement drew 26,000 people to the National Mall Sunday--graduates, their families and friends, as well as GW faculty and staff. The D.C. Graduates and their families celebrated achievements and the majesty of the National Mall.